Being Tuesday it can mean only one thing. Regular readers would know that I am a regular participant of IBOT and have been for quite some time. In fact I am #teamIBOT member because I just love IBOT that much. I can't even remember how I first came across it but I am glad I did because when all else fails I always seem to come up with something to blog about on a Tuesday. Though it is not just about the writing and getting a post out. IBOT is also all about reading and sharing some blogging love as well. 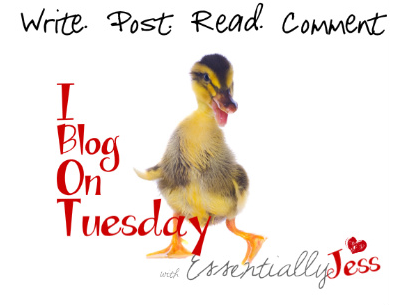 Checking out the IBOT posts each week means I am pretty much guaranteed to read some of the best posts of the blogosphere all found in one easy location. Total win-win I tell you. But I digress, as much as I love all that is IBOT I hadn't meant to gush about it today. What I meant to do today was alert your attention to some of my recent posts. For whatever reason they seem to have slipped under most readers radars. It is with great pleasure, that for the first time, I am joining in with fellow #TeamIBOT member iSophie's groovy new linky. This is the second month it has been running for however last month I didn't quite have my act last month so I couldn't participate. This month however I am on fire with having my act together. Thanks. I would love to do a colour run as well but they don't have them here. Thanks buddy :) I am so excited about the race. How did you do that clever thing ... putting posts within your posts. Genius! Will come back for a fuller read this arvo .. Some of it I just added the same pic and made it smaller and then just copied the opening paragraph and linked the title. For other bits are from a widget I used called linked within, which I normally have on every post. I am not actually sure how I have it in this post as many times as what I do. So not really all that clever. hope you enjoy your reading when you come back and thanks for stopping by. Good luck for the city to surf - I am sure you will have a great time !!! I didn't think it was really an option for me either but having now travelled the distance I reckon it may well be doable! Yay, goodluck with City 2 Surf, it will be awesome! Where did Tuesday come from? Where did the end of May come from? This year is going way too fast, - good luck with City to Surf, I'm sure you will do well. You are an inspiration to many applying yourself to such a goal. Thanks for such kind words Katie, and yes how do the days pass so quickly? Luck I live in such a small place and the city and surf are not all that far from each other! My pleasure with the comments lovely, I know what you mean about it being so busy! Oh, good luck with the City2Surf! You'll have an awesome time! We have ours coming up in August - I am pumped! thanks so much !! Trouble resolve with Samsung ML-1520 on Win8 64bit. Lots of introductions from Germany.